This dissertation aims to identify linguistic precursors of developmental dyslexia. Currently, dyslexic children are diagnosed only after they have tried (and failed) to acquire reading skills. Ideally, dyslexic children should be iden­tified before the onset of reading instruction. An early diagnosis could lead to early intervention which, in turn, could have a positive effect on dyslexics’ reading ability. Since dyslexia is a genetic disorder, a viable way to identify lin­guistic precursors of dyslexia is to study the language development of children with a genetic risk of developing dyslexia. 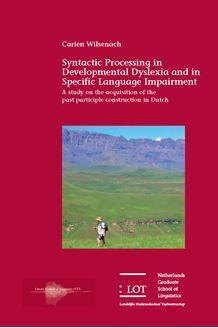 This dissertation focuses on mor­phosyntactic development in children at risk for dyslexia, and more precisely on these children’s mastery of the past participle construction. The develop­ment of the at-risk children is compared to that of normally developing chil­dren and to children with Specific Language Impairment (SLI). This thesis shows that children with a predisposition for dyslexia differ from normally developing children in their morphosyntactic development. With regard to their perception and production of the past participle construction, the at-risk children do not exhibit deviant morphosyntactic development. However, their representation of the morphosyntactic dependency underlying the past participle construction seems vulnerable. In complex sentences, the at-risk children generate ungrammatical constructions and omit functional items such as auxiliaries, determiners and verbal morphology. The behaviour of the at-risk children is best accounted for by assuming that they suffer from a limited processing capacity that affects their control over morphosyntactic dependency relations. This dissertation is of relevance to scholars in the fields of reading- and lan­guage disorders as well as to clinicians working with dyslexic and/or language impaired children.